John Law was a Scottish banker who developed close ties to the regent for the young King of France. In 1717, he founded the Compagnie de la Louisiane ou d'Occident, later called the Compagnie des Indes, with a mission to exploit the mineral and other resources of French North America. As Law's banking reputation grew, he was able to sell shares to investors not only in France, but in England and the Dutch Provinces as well. This map was published in 1719, along with a supporting broadside in German (ID # 1010.02 and 1010.03), apparently in an effort to sell shares in Germany. It is a smaller version of Delisle's foundation map of the region, Carte de la Louisiane et du Cours du Mississippi, 1718. (Weigel copied Delisle in virtually every respect, including the French-language references to copper, lead and other metals, except that in the area below the Missouri River, he translated Delisle's "Tout ce Canton est plein des Mines" and "Pays plein des Mines" into Latin: "Totus hic tractus est plenus Metallorum" and "Regio Metallorum.") The cartouche shows two well-dressed gentlemen apparently exchanging shares for a chest of coins. Weigel's map has traditionally been dated to 1734 (nine years after Weigel's death), probably because the only copy in the Library of Congress's authoritative cartobibliography appeared in an atlas published in 1734 (Phillips 1909 #582). In fact, Weigel's map and associated broadside are found together in a rare atlas by Johann Kohler in the Bayerische StaatsBibliotek published in 1919. See http://daten.digitale-sammlungen.de/~db/0007/bsb00077092/images/, Images 37, 39, 40, accessed November 19, 2014. (The dealer who sold the map and broadside in the collection reported that they were bound together in an atlas of 1719.) A copy of the broadside (a "very rare German tract . . . issued to encourage sales in Germany of shares in Mr. Law's Mississippi Company") was sold in the 1966 Thomas Streeter sale, #116, dated "ca. 1720" and "Bound with" Weigel's map. And a copy of the map physically joined to the broadside was offered in Martayan Lan Catalog 49, #32, November 2013. 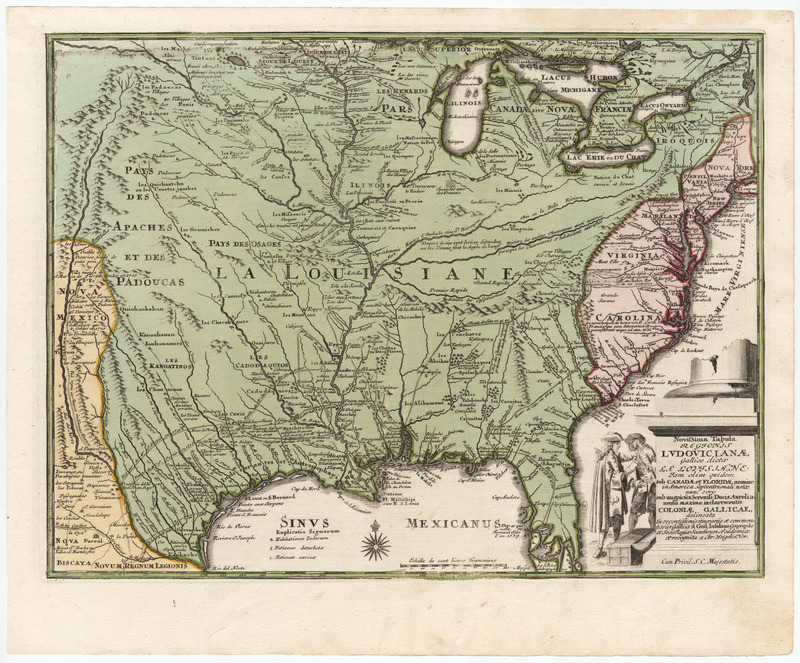 A careful reading of the broadside makes it clear that it was issued as a companion to the map, intended to promote sales of the Mississippi Company in Germany. See Notes for ID #1017.02. Unknown, probably Köhler, Johann David, Schul- und Reisen-Atlas, Aller Zu Erlernung der Alten, Mittlern und Neuen Geographie dienlichen Universal- und Particular-Charten, Nuernberg 1719.